Are you considering marijuana for glaucoma? Marijuana for asthma? Marijuana for pain relief? Marijuana for arthritis? Whatever the reason you’re looking to accrue some medical cannabis, they’re several ways to get it and to grow it. One method of growing marijuana cannabis is the greenhouse method. A greenhouse is essentially a building space where you grow plants. It can have either a glass or plastic roof and also glass or plastic walls. Sunshine is absorbed inside a greenhouse, which is good for growing plants. 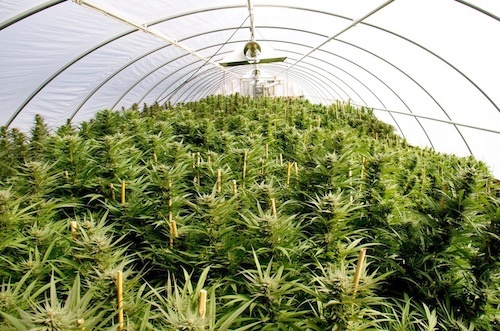 A marijuana greenhouse is usually a glass house. The greenhouse needs to have the following systems in place, a watering system, row system, trellis system, darkening/blackout curtain system and automated environmental controls. You can choose to plant your cannabis in a pot or in the ground. Then set up a wide row system for planting the marijuana and you need an effective watering system to automate the water feeding process to the marijuana cannabis plant. The trellis is the stake or wire that the plant is attached to, once you decide on how you want this system, set it up in your greenhouse. The blackout curtain system is essentially based on how many hours of light are available at specific times of the year, and is used to control the amount given to the plants. And you need automated environmental controls to maintain the ideal humidity level, ideally low, to grow cannabis in a greenhouse. You’ve now decided on the systems and how you’ll set them up in the greenhouse, and you have your medical marijuana seeds in pots. They will go through two phases a vegetative and a flowering phase. In the vegetative phase the plant needs about 18 hours of light daily while it grows to a desired size. Then it enters the flowering phase where the greenhouse uses the blackout curtains to sustain days that are 12 hours light and 12 hours dark. Then in about six weeks or more your flowers will be ripe and ready for harvest. Some say growing marijuana cannabis in a greenhouse is easier than growing it outdoors or in a grow room. It is considered a safer method that also offers protection from natural elements. The greenhouse allows you to extend the growing season of the plant that can help the plant to ripen properly. It is also easy to control pests in a greenhouse environment. And, most importantly it is said that the greenhouse method produces more potent marijuana cannabis. So whatever the reason you need to get a good supply of your own Pot, if you’re up to the challenge, growing it in a greenhouse can is an option. But if you’re not, look up a medical marijuana delivery service and get your medical marijuana online. It will be great if we grow the marijuana in the room. Surely i will try. Thanks for the information. Amazed your last article indoor marijuana growing, Its more interesting I did not know marijuana can grow in the green house. Do you need a transparent mirror for greenhouse growing? As far as i know , in the green house, there needed such. Thanks you so much for the information. Lovely topic. Thanks @supports for the information. I am little bit confused about transparent Glass.